Brazil football icon Ronaldo and Russia legend Andrey Arshavin joined Olympic figure skater Evgenia Medvedeva and hundreds of Moscow youngsters at the opening of Box MSK - Nike’s vibrant new sports and cultural centre in Gorky Park. The innovative multi-purpose space opened yesterday (June 12) offering Moscow’s youth the opportunity to be more active and enjoy the new facilities which cover a wide range of sports. The launch of Box MSK, which is spread over 4685 sq m area and boasts a 530-sq-m pavilion and 458-sq-m rooftop space - coincides with Russia hosting football’s biggest global tournament this summer, World Cup 2018. The top international brand said it aims to capitalise on the increased interest in sport and Nike’s long-standing commitment to inspiring and enabling a new generation of athletes in the country. The launch comes at a time when startling data from heath experts reveals that in Russia, fewer than one in four boys and one in six girls are active for an hour a day – the minimum recommended by the World Health Organisation. Nike pointed out that it was committed to helping reverse this trend and Box MSK will become a basecamp for the ‘Made to Play’ initiative, a worldwide programme to boost youth participation in sport. So far, the global brand along with its community partners Tagsport, Children Sport Foundation and Perspektiva has engaged more than 50,000 children in Moscow and St Petersburg and helped them become more active. Tagsport creates free programmes to help kids fall in love with football; while Children Sport Foundation brings sport and play into schools; and Perspektiva uses the power of sports to unite – by giving kids with and without physical disabilities the chance to play together. 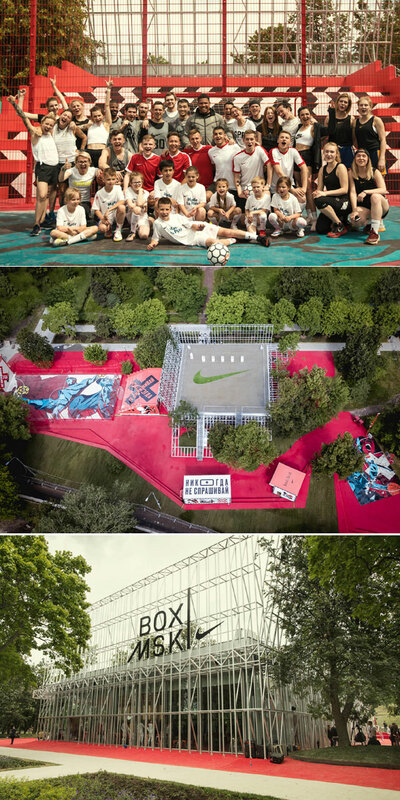 The innovative Box MSK will be open all year round, including an outdoor football court inspired by the traditional Russian korobka, as well as a streetball court designed for three-on-three basketball. There are training and yoga spaces, both indoor and outdoor, while the centre will also become the base for Moscow’s Nike Running Club. The centre already has 7,300 hours of sports classes scheduled for the coming year and more 150,000 visits to the site are expected site in the next 12 months. All of these new spaces are brought to life through vivid graphics and visually stunning artwork, creating the ultimate sports playground which will also grow into a hub for creativity, culture and self-expression through curated programming and partnerships. Bert Hoyt, the VP and general manager at Nike Europe, Middle East and Africa (EMEA), said: "Nike believes in the power of sport. We want to enable young people to play more sport and reach their full potential." "Box MSK offers excellent facilities to play sports and a range of cultural programs, design workshops and exhibitions to really connect with the diverse, talented and adventurous young people of Moscow," he added. The centre was designed by Kosmos Architects after Nike, in collaboration with Strelka KB, invited proposals from Moscow’s architectural community. The result is a dynamic interpretation of how sport integrates into the modern urban environment. The objective was to highlight the synergy between Moscow and Nike through the lens of sport and innovation. The building’s form takes inspiration from an open shoe box, while its transparent glass walls represent the iconic Nike Air unit. External features, such as metal-gridded walls and on-court illustrations echo Moscow’s industry and infrastructure. Also key to the project was creating a structure which will have a lasting legacy and become a landmark befitting of its place in Russia’s most famous park. Marina Lylchuk, the director of Gorky Park, said: "The park has always been a magnet for sport and cultural expression and this is something we have actively tried to encourage."